Last week I returned home to a box outside my door (love boxes!). Because all boxes are Max's (or so he thinks), we opened it together to find these amazing goodies inside. They were from the lovely and super sweet Debbie of puanani. There were so many wonderful things. A beautiful and really colorful koi nobori for Max for children's day. Max also got a great book about seasons in Hawaii and a fun card. 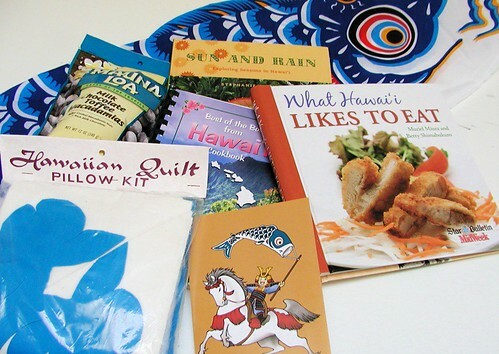 There are two amazing Hawaiian cookbooks: What Hawaii Likes to Eat and Best of the Best from Hawaii Cookbook. I had seen "What Hawaii..." on her blog a while back and had asked about it (repeatedly, but only because my browser wasn't working, really), so imagine my surprise when it showed up at my house, and brought a friend too! I spent a wonderful month in Hawaii when I was in grad school, as part of my research. It was quite an amazing time. The people, the land, the weather, the food were all indescribable. I came back from my adventure with one tiny pamphlet cookbook that I got at the Bishop Museum, and ever since I've regretted not getting something more substantial. But now I have the opposite problem: there are so many tempting recipes, I don't know where to start! I'll have to work on that. In the meantime and to distract me from my indecision, there's a wonderful Hawaiian quilt kit. Have you seen Hawaiian quilts? So beautiful. A kit is perfect for me. And it's in blue, Max's favorite color! I've "met" some really wonderful people through blogging. Debbie and I have never met in person, but I do feel like I know her almost as well as I know the people in my sewing group. I feel truly blessed to have wonderful bloggy friends and local friends in my life. Thank you, and mahalo!